Considering the average person spends over 90,000 hours at work in their lifetime, it’s worrying to hear that only 23% of British people are happy in their jobs. In today’s society, it’s easy to get caught up in the demands of a job and forget to properly take care of your health. Being happy at work is paramount to your overall wellbeing, especially considering how much of your week is spent at your job. Working long hours often causes people to develop unhealthy habits such as smoking, drinking lots of caffeine or under sleeping to keep up with the demands of their job. These kinds of habits take a toll on your physical health over time. The majority of people are in desk-based jobs, but our bodies were designed to move, and working in a sedentary role for 10 years is likely to double your risk of getting colon cancer. On top of this, in many workplaces, employees are regularly exposed to harmful chemicals and bacteria which can cause disease and infections. Keeping your body physically fit and healthy is essential to having good mental health. Companies should encourage their employees to look after themselves, and not push themselves too hard to the point where they are putting their health at risk. Studies have shown that employees are 20% more productive than unhappy employees, so it is really in the best interest of everyone. So, who is getting it right? In countries that prioritise family life and recreational activities overwork, the happiness levels are significantly higher. In Denmark for example, widely considered the happiest country in the world, just 2% of their employees work long hours regularly. Evidently, a good work-life balance is essential for employees overall happiness, and luckily in the UK more an increasing number of companies are catching on to this. Flexitime and working from home is becoming more commonplace within companies, and systems like these allow employees to put their health first when they need to – a great step in the right direction. 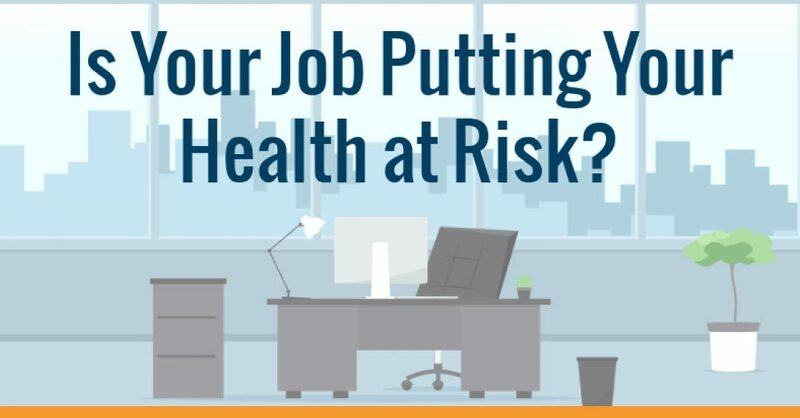 This infographic created by Katie on behalf of Stanley R Harris, looks at what makes a healthy work environment and looks at the health risks commonly faced in certain professions. Read on to find out more about how your job could be putting your health at risk.